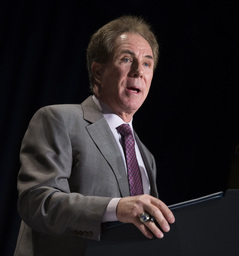 CHARLOTTE, N.C. (AP) Darrell Waltrip will soon "Boogity! Boogity! Boogity!" his way into retirement. Everyone yearns for an opportunity to say farewell on his or her own terms. Waltrip has that chance now to bring his second career as a NASCAR broadcaster to a close and squeeze out his classic catchphrase as Fox Sports' portion of the NASCAR schedule wraps up in June. NASCAR fans have demanded change in nearly every area of the sport, yet one area tiptoed around for some reason is the cracker-barrel, down-home broadcast Fox gives its audience for its coverage of the elite Cup Series. The 1-2 punch of Waltrip and Mike Joy spend too much time spinning yarns from the good `ol days while relative newcomer Jeff Gordon awkwardly guffaws along with the gang. Waltrip has hinted this could be his last season, ending a broadcast career that began with the 2001 Daytona 500 and Fox Sports' heralded acquisition of a slice of NASCAR's TV rights. He was in tears when brother Michael won the race at about the same time Dale Earnhardt was killed in a fatal crash elsewhere on the track. "Mikey! Alright!" he cried. Then Waltrip looked at Earnhardt's wreck. "How `bout, Dale? Is he OK?" Waltrip acknowledged Fox Sports had assembled "an amazing group of young and enthusiastic" talent in his tweet, "but they still need "old guy" wisdom, I'm happy to say that for another year that "old guy" will be me!" With 11 Cup races remaining in the network's coverage this season, there has been speculation Waltrip would announce his retirement as early as this weekend at Bristol Motor Speedway. The talk was so loud last week - with the assumption that Harvick is in line to replace Waltrip in the booth - that both the 2014 champ and his manager both insisted Harvick will still drive for Stewart-Haas Racing next season. Waltrip is one of NASCAR's storied characters, one of the first to build a brand around his supersized personality, and he parlayed it into a lifetime as one of the sport's strongest ambassadors. But active as he is on social media, there is no way he has missed the overwhelming criticism directed his way over the past several days in particular. He seemed a bit muted Sunday at Texas Motor Speedway, and seemed slow to utter his "Boogity! Boogity! Boogity! Let's go racing, boys!" call to open the race. While Waltrip and Joy have been picked apart by those unhappy with the broadcast, Gordon has seemed trapped since his 2016 debut. The booth is not big enough for the two veteran egos and Gordon, the Hall of Famer who was supposed to be NASCAR's version of the athlete-turned-broadcaster that Tony Romo has become for CBS Sports. Still trying to shoehorn his way in while being respectful to his elders, Gordon has had to learn to insert his opinion and, well, correct Joy and Waltrip. Dale Earnhardt Jr., meanwhile, was an instant hit with his exclamations of "Slidejob!" for rival NBC Sports. Fox Sports, like everything else in NASCAR, needs a change and the first will likely be the 70-year-old Waltrip making the biggest call of his 19-season TV career - that it is time to hit the road. He made his debut in 1975 and has been part of NASCAR's road show ever since. He has seen it all, from the lean early days to NASCAR's popularity boom to its current fight to stay relevant. That was 2001, and the modern fan NASCAR is chasing to watch on TV or on their devices has little connection to a driver who made his last Cup start when today's budding stars like William Byron were still toddlers. Fox Sports has groomed drivers like Harvick to become broadcasters and has used Bobby Labonte, Regan Smith and new hire Jamie McMurray heavily on race day. The network grabbed analyst Ricky Craven and newshound Bob Pockrass when ESPN pulled out of NASCAR this season, and strengthened its commitment to the sport by investing in a state-of-the art virtual studio set in Charlotte. Fox's resources are deep, the pit reporting team is knowledgeable and Larry McReynolds has found a new role since Gordon replaced him in the booth.